It’s Book Blogger Appreciation Week! A time for us to all gaze at our belly buttons, thinking about what it means to be book bloggers and why it is so awesome. Also to give each other internet high fives, for a full week. BBAW today is all about getting to know our fellow bloggers a little better. I was lucky enough to be set up to for an interview with Sarah of Word Hits. Word Hits looks at novels and writing, but often with a focus on the cultural aspects of reading and writing. You occasionally review books on your blog, but more of your posts are devoted to the reading and writing culture: to events you’ve attended as a reader and/or as a writer, such as the Bread Loaf Writers’ Conference and a reading by Philip Levine. What’s your preference when it comes to reading and writing about books online: reviews or more cultural stuff? I blog about the reading and writing culture and related topical news. Really, I am just having fun reacting to things from a bookworm perspective. For example, I did a blog on “Famous Debts in Literature” during the budget crisis. After a Jane Austen fragment auctioned for $1.6 million, I blogged about the pain of reading unfinished books. So while I write about books, it’s often from an angle. Also, per my “quick hits” tagline, I try keep to 350 words or less. I notice that on your blog you state that you write reviews of books you love. What do you think the blogger’s role or duty is, as far as positive and negative reviews of books go? Why did you make the decision to write only about books you enjoyed reading? It’s wonderful that so many book review blogs have sprung up, especially with fewer print publications covering books. I plan to spotlight books I love, but I decided not to bother with the ones I don’t. I should note here that I do not accept any review copies. Also, full disclosure, if I’m not enjoying a book, I might abandon it (gasp) in favor of one of the many stacked on my shelves. I do think it’s important to be honest in book reviews, and I’m grateful there are so many voices out there blogging frank reviews. I look to them for suggestions, and I also love to peruse them after I’ve finished a book, just to see others’ reactions. As a writer, what do you think of blogs as promotional outlets or ways for writers to establish connections with their audience? Do you look at social marketing sites (blogs, twitter, facebook pages) as necessary tools for the contemporary writer? Why or why not? Any published author should be out there in social media. If only so we readers can find them. However, many writers make the mistake of going overboard with the marketing angle, treating their blog like it’s the PR Newswire, which it’s not. Just because I loved your book doesn’t mean that I want to hear how many stops are on your tour or get blasted with repetitive promo tweets. I prefer the author blogs which give book recommendations or perhaps a glimpse into that writer’s inspiration. Let me in—don’t try to sell to me. I will add that I think blogs and twitter are an especially good resource for writers. I have gotten all sorts of advice, and I’ve “met” some very interesting people who are now influencing my reading and my writing habits. I was interested in the posts you did about the sales at Borders (one about why book buyers should skip the Borders sales, and another a response from a former Borders employee). You encouraged your readers to shop at independent bookstores rather than hitting the sales at Borders. Any thoughts on the interplay between indies and book blogs? What value do you think there is in encouraging people, via your blog, to shop at independent bookstores? I aim to shop indie, still the Borders downfall hit me hard. As I blogged, losing some 600 bookstores all at once is like when the Death Star hit Alderaan in Star Wars. All those employees, who like me, love books. So I was happy to tell both sides of the story. Having said that, I am a big fan of #indieThursday, in which you visit a local bookstore, buy a book, and then tweet each Thursday. I’m blogging about it this week. It’s important to note that not just indies, but even Barnes and Noble and other book chains are having serious troubles. So really, readers need to go into stores and buy books! Book bloggers have a duty, I think, to promote local bookstores. That is one of my suggestions for BBAW next year, to make one of the daily topics a favorite bookstore or book shopping experience. These are our people! Finally: any plans for your blog over the coming months? Starting next week, I’m planning a regular feature on Favorite Bookstores. It will debut with a guest post—a final ode to the last days of Borders. But the main focus will be independent gems, such as The Tattered Cover in Denver and Posman Books in Grand Central. When I travel, especially, I like to browse the local bookstore. Also, I plan to step up my game and take part in some of the read-a-thons or fun book-reading challenges. No one has ever commented on my ability to be part of a community. I am that person you see at a party, plotting her way out and with at least one book and one magazine in her purse on the assumption that the party will be the most boring social engagement of the year. I am the ridiculous Peace Corps Volunteer who took six months to learn the names of the volunteers in the group following mine, because I was so hell-bent on avoiding social interactions. So in theory I love the idea of Book Blogger Appreciation Week because, you know, I believe! that book blogs are changing the way we write about books and interact with authors and other readers, and that book blogs are improving the “reading landscape” (don’t ask me what I mean by that term) and will sooner or later start to be read by people who don’t run their own book blogs. I mean, there are already some great book blogs that have reached that stage – but we need more! 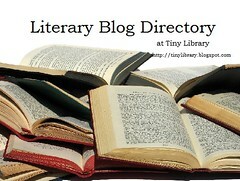 A veritable tsunami of book blogs! But in reality, I am that awkward kid hanging on the edges not sure of how to participate because (a) I am awkward and (b) I feel awkward with today’s conversation piece and talking about bloggers I like, who’ve influenced me, whatever, because what if I leave someone out? There’s one blog that I started reading just a couple weeks after I started this one; and while I feel a certain affinity for the author because we’re both NJ people (!) and we both went to Rutgers (!!) and her husband lived in the same dorm I lived in, though not at the same time (!!!) it’s more that I want everyone to read her blog, this second, right now. Soy Chai Bookshelf is one of my favorite book blogs, and I feel like one of the most chronically underappreciated. Jennifer writes fantastic and incisive and insightful reviews of books I love and many that I don’t love (yet) but have decided to read based solely on her recommendation. Also she recently started a new vegetarian feature where each Monday she writes about vegetarian or vegan books, restaurants, cupcakes. That’s it for me, today. Go read Jennifer’s blog and dare to tell me you don’t love it.